This stunning ruffled blouse makes a fantastic addition to gothic formal attire. The Black and White Brocade Blouse comes with a detachable cravat. The cravat and sheer sections of the top display ornate brocade patterns. Take charge of the scene when you step out wearing the Black Brocade Gothic Tailcoat Blouse. 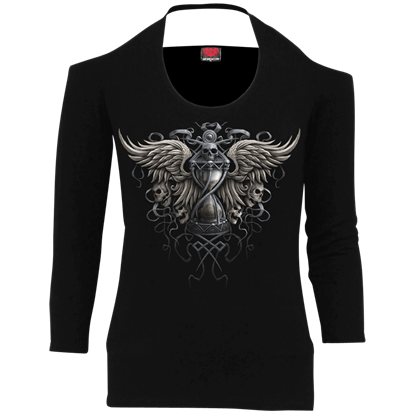 This long sleeve gothic top draws on Victorian styles with its high neck, puffed shoulders, and a lace-trimmed, tailcoat inspired length. The key ingredient to the most beautiful gothic roses in the land is not care, water, or even music, but something more sinister. 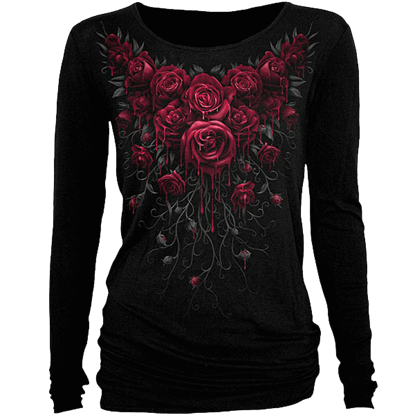 This Blood Rose Womens Long Sleeve Shirt depicts many fine gothic roses, all oozing with lifes essence. 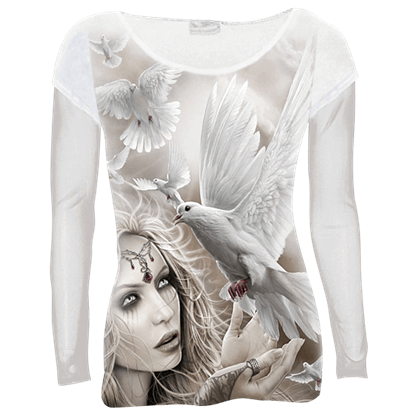 This gorgeous mesh blouse makes a fabulous addition to your wardrobe with its delicate beauty and vintage style. The Brenda Black Mesh Victorian Top displays dramatic ruffles and frills around the neckline with a tie in the middle. 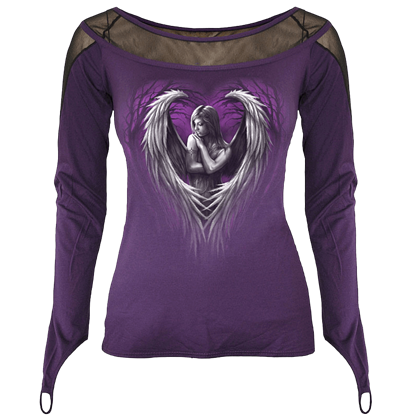 Angels are seen as powerful, unfailing, and unflinching, but in this gothic shirt, they can also be tragic, as this Broken Angel High Neck Long Sleeve Womens Shirt depicts an angel that has lost everything in its fall from grace. Do you ever have moments where food seems to be your best friend? 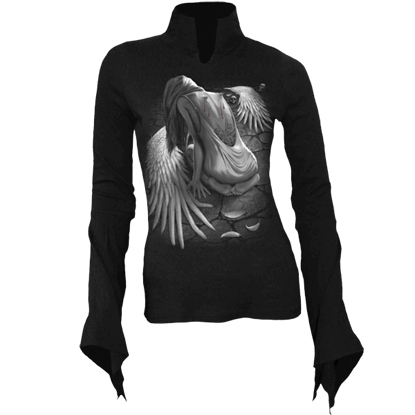 Dragons have those too, and in this Comfort Feeding Womens Long Sleeve Slashed Shirt, we see an adorable dragon that has decided to munch its sorrows away. 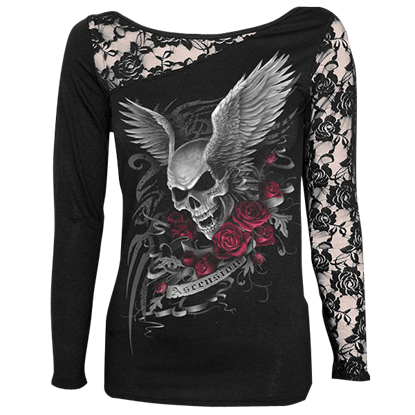 For an edgy twist on gothic style, the Dark Roots Womens Laced Long Sleeve Top combines contemporary elements with classic pieces. A gentle neckline adds comfort and highlights the full sleeves laced from shoulder to hem on the outside. Time lays claim to the world in many ways. 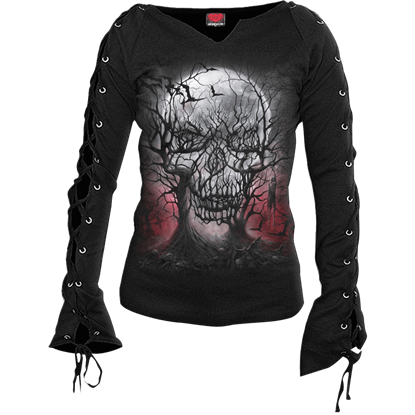 With Darkness Scoop Halter Long Sleeve Top, you can express the subtle beauty encased within a dark fate. Declare what most fear to be the end as the exquisite truth of life and peace.